What does it actually mean, 'to walk along The Camino'? Camino means 'way' or 'path' in Spanish. El Camino is the Way, the Way of St. James. 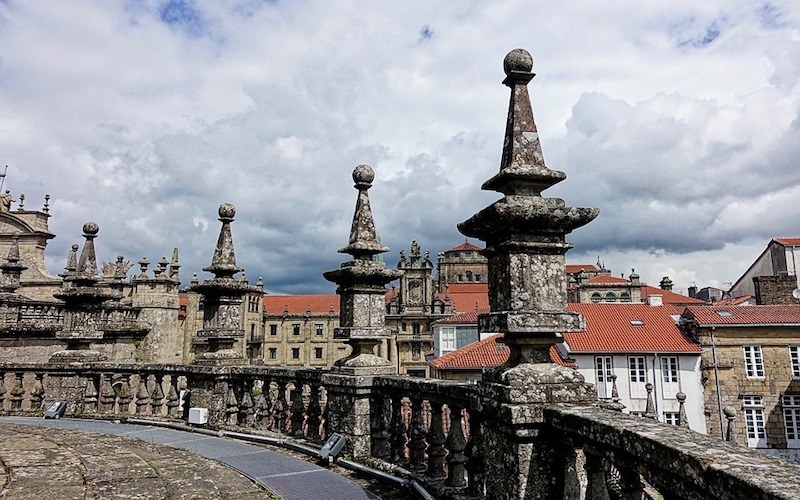 Camino is not just one way, but many different routes that lead to Santiago de Compostela in Galicia in the Northwesternmost corner of Spain. Every year thousands of Christian and non-Christian pilgrims walk the Camino. The most popular route is the French way or Camino Francés, which starts from Saint-Jean-Pied-de-Port on the French side of the Pyrenees. This route is about 800 kilometers long, but very walk it all at one time. People's motivation for walking along The Camino has changed radically over the past centuries. Originally it was a Christian commitment, a journey one should make once in his lifetime. The modern pilgrim's intentions are quite different. Often it is not even religious anymore, but rather it's "a personal journey". And, for many a social traveler, the meeting together with many nationalities and cultures can be an exciting and invigorating experience. Many return home with friendships for life. As a pilgrim you will need to most basic stuff, which is in sharp contrast to most people's lives today, where we have access to virtually everything we need, and more, right at our fingertips. There is much symbolism associated with walking The Camino. And through the centuries, there emerged many standards, you can choose to follow. Everything will be explained to you on this site or in Spain is More's guidebook, which you will receive before departure. Buen Camino!